The Japanese know it as Mach GoGoGo. Americans imported it during the mid-1960s. It’s been a source for retro-clothes and throwback merchandising for years, whose popularity has incited several new television series, comic books, and toys galore. There’s even a catchy theme song those who’ve never seen the show could probably hum the chorus to. 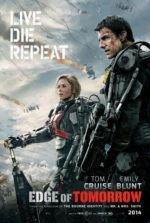 Now it’s a wondrous piece of eye-candy filmmaking by Andy and Larry Wachowski. 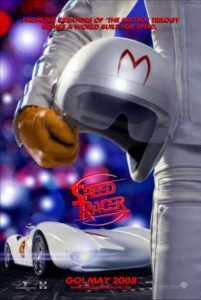 And though it may not be the popular opinion about the film, Speed Racer is unlike any film you’ve ever seen. Suffice it to say, we follow lifelong racer Speed (Emile Hirsch, from Into the Wild) on a journey to keep his modest suburban family whole in lieu of wealthy racing corruptor Royalton (Roger Allam). They’re a tight-knit unit: Pops (John Goodman) builds the family car, the Mach 5; Mom (Susan Sarandon) handles PB&J duties; Trixie (Christina Ricci) keeps Speed’s heart va-va-vrooming; Spritle (the hilarious Paulie Litt) and Chim-Chim (a monkey) serve as cheerleading comic relief. All stand on the sidelines watching Speed drive through half-futurist, half-1950s retro landscapes to defend the dignity of racing enthusiasts. But I’m not going to waste my time writing in detail about the plot. The Wachowski Brothers have directed only four other movies; from Bound to The Matrix Trilogy, they commonly rely on ultra-vibrant visuals combined with pseudo-intellectual plots to elevate their films into cerebral entertainment. (Diehard fans read their work as non-linear and avant-garde; to that I say look up the definition of non-linear.) Here they disengage themselves from embedding references to the Bible and German philosophy into their storyline. This film is all about the surface, or rather the piling of surfaces onto each other to create an impossibly lush texture made up of more than 2,000 effects shots. Production designer John Gaeta, having worked with the Wachowskis on The Matrix, gives every frame a kaleidoscopic color and layering. The screen glows with detail, compiling an image with background and foreground moving in opposite directions like your typical anime. Indeed, the film is a living cartoon, given to only one or two solemn, stationary moments between Speed and his parents. But then onto the next race! Like a perpetual rollercoaster from a videogame future, racetracks contain moguls and more twists than human intestines. We zoom-in back and forth between ongoing banter between racers, spectators’ awes and gasps, and the occasional shot of Spritle and Chim-Chim with jaws dropped. Conceived with digital effects and not the least trying to be real, the settings are an expansive cartoon universe, alive with fluorescence and movement and synthesized world-making. That quality actors like Goodman and Matthew Fox (playing it super-cool as Racer X) are present is merely an added bonus. During race scenes we lose ourselves in impossible car chases where vehicles bounce and roll with seemingly no damage, sport silly mace-like weapons, and certainly have no need for a tune-up or fill-up (gas is never mentioned). Newton is rolling in his grave, considering how much time these cars spend breaking the laws of gravity. Nevermind how cars spin and tumble in avoidance of their opponents. Acid trips have made more sense. Nevertheless, what a joy to behold. I realize I am in the minority here, as reception has generally been split between love-it and hate-it, with a strong percentage leaning toward the latter. Consider the Wachowski’s film an anime with some humanity added for good measure. At one point, a ninja breaks into Speed’s hotel room only to meet with Pops, who twirls him overhead like something out of Hanna-Barbera. We half expect a fight cloud to develop. Cartoon sound effects (and the inevitable theme song) crop up to further complete the animated experience. 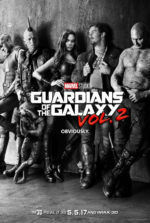 Normally working under R-ratings, the Wachowski’s have made this a PG-rated feature. View the experience with a willingness to enjoy childhood cartoon aesthetics, and you’ll find yourself entertained by the never-ending movement filling the screen. Speed Racer might not evoke grandiose emotional involvement with its narrative or characters. It doesn’t need to because the visual artistry of the production bursts with flashing, phosphorescent, eye-popping, sensory-pleasing stimulus unlike anything the new Digital Age has brought us. Beowulf and Sin City have paved the way for visual wonders like this picture, a piece of living neon, a movie that will no doubt induce seizures. You’ll leave with a great sense of exhaustion, and afterward need a nap to rest your eyes.